In a review of documents produced for 1,450 digital coin offerings, The Wall Street Journal has found 271 with red flags that include plagiarized investor documents, promises of guaranteed returns and missing or fake executive teams. The Boston-based firm introduced a feature on Tuesday called “Buy the Market,” which allows users of its Circle Invest app to purchase all seven digital coins offered on its platform at the same time. In a rare interview, Bitmain’s Jihan Wu talks about his plans to take on Nvidia, Intel, and AMD. In this article, Tony Sheng of Decentraland, explores various strategies that crypto projects could use to protect themselves from competitors. Our favorite professor, Scott Galloway, discusses tethered coins and the cryptocurrency landscape with NYU finance professor David Yermack. Regulatory scrutiny is increasing, but this isn’t slowing the pace of blockchain activity — if anything, it’s helping the industry mature. As financing methods shift and investors search for the killer app, CB Insights dives into eight trends shaping the future of blockchain technology… specifically highlighting ICOs, venture, and corporate activity. There’s a secret pattern that appears in every crypto before it soars. The last time this insider found this pattern, it could’ve helped you turn every $500 into $17,990. His new book shows you how to get started with these rare opportunities. The North American Securities Administrators Association (NASAA) recently announced one of the largest coordinated series of enforcement actions by securities regulators in the United States to crack down on fraudulent Initial Coin Offerings (ICOs), cryptocurrency-related investment products, and the people behind them. For now, this seems to have triggered the massive selloff as of late. Tune in to our go-to Youtuber, I Love Crypto, for more details (🎥 4 minute video). When you think of the US Securities and Exchange Commission, “fun” isn’t the word that usually comes to mind. That’s especially true when it comes to it’s approach to initial coin offerings (ICOs), which are increasingly in the agency’s crosshairs for serious enforcement actions. 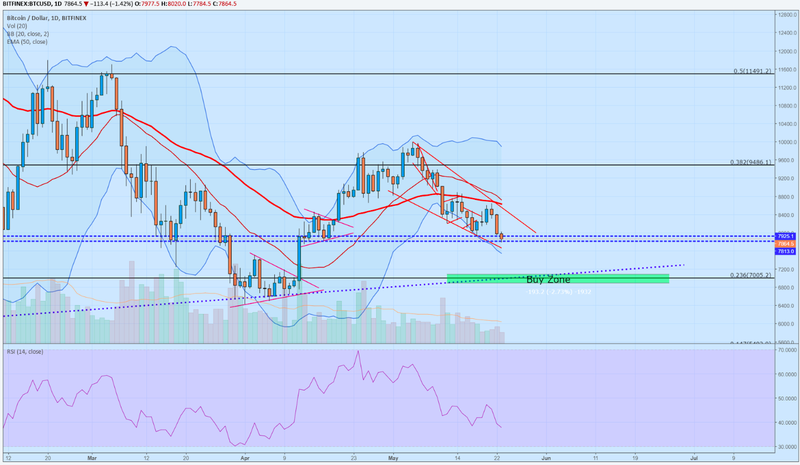 As we can see, Bitcoin (BTC) has broken the $8100 support and is currently sitting at the $7500–$7600 levels. This level is very important and if we see it fall through, then we’ll most likely retest the trendline formed off recent swing lows. On the other hand, this may give us a triple bottom (bullish reversal pattern). But let’s wait for confirmation before any entrance. Why are there so many Russians in crypto?